With an outstanding catch record in all aspects of his angling and being renowned as a Mr Nice of the carp world Lee Merritt took time out to answer some questions for us at Catch and Release. The one that sticks in my mind is Shoulders from Abbey Lakes in France, I caught her on the last night of my trip, she weighed in at 76lb 8oz,A week before she weighed 84lb, but was spawned out when I caught the fish, at the moment she weighs around 95lb. The first thing I would say is research the venue by walking around the water or asking people on social media for advice, then go and visit the place, fishing it as close to the date of the match as you can, as things change from one week to the next, be prepared i.e. make rigs, pva bags before the match, you don’t want your head down making bags while you should be watching the water, if there’s a two rod limit in the match try to have another couple of rods set up and ready to go, If its a pairs match, fish as a pair, one more thing I would say is have a min of 2 landing nets each person. What’s been your favourite venue you have fished and what made it so special…..
Well that’s a hard question really, I just love going angling.. But I enjoyed fishing the Arena in Essex which I fished 15-20 years ago. .A very weedy water which held some big fish, it was also full of crayfish which was a challenge but they was good for the fish, I’ve also fished some big waters aboard, which I love doing. If you had only one kilo of bait to use to fish 24 hours how would you best apply it. That depends on the venue, But the good old solid bags work well where your time is limited and your fishing for one bite at a time. 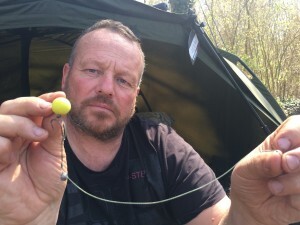 The angler would be my friend Terry Dumbleton a top man and just simply a nice guy, the famous angler would be my old mate Rob Marsh, we have been fishing together for years now and get on really well. The venue would be the Mangrove I’ve have fished it with Tim Paisley. but I would my friends to fish the place.. If you could catch any carp past or present what would your dream capture be….. I would have loved to have the Bulldozer from the mighty Orient. Again be prepared, and if things are not working change things. I very rarely drink on the bank, but if I it would be beer. Your known as liking a bankside rave what’s your fave carping hype track…. I like all types of music expert for Rap and jazz.